Spiritual Amethyst! 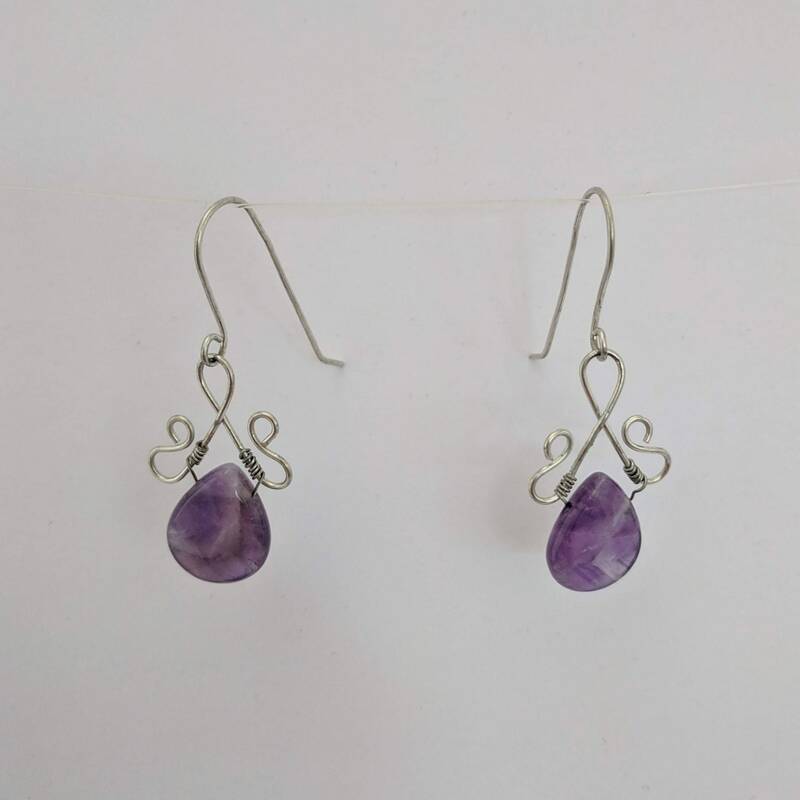 These dangle earrings are made with large 13mm x 15mm faceted amethyst teardrop briolettes wrapped on a double shepherd's hook design that is approx. 5/8" wide. The pendant is approximately 30mm in length which is a little over an inch. When attached to the handmade earwires the overall length is approx. 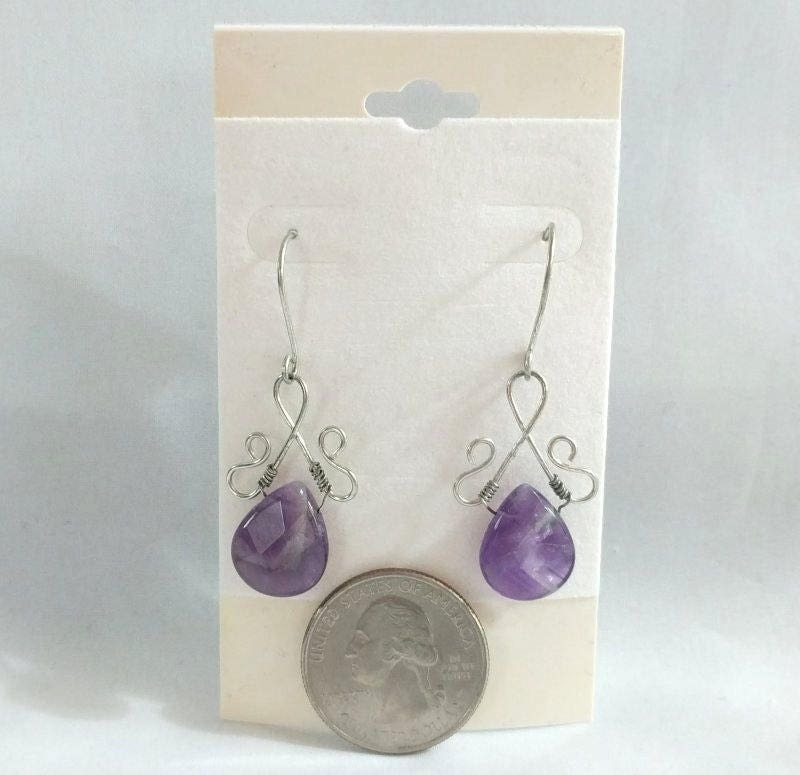 44mm or 1 3/4" from the top of the earwire hook to the bottom of the amethyst stone. Available in silver filled metal. 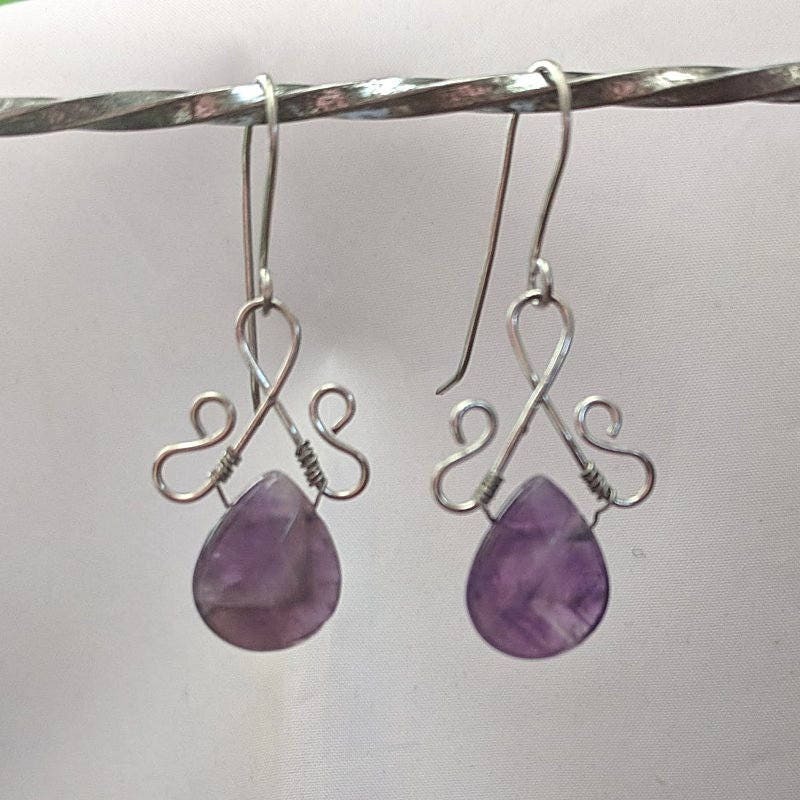 Other metals,including sterling silver available by custom order. Contact us if interested in ordering one. We ship via USPS Priority Mail - Insured so that you will receive your package in 2-3 days once it is posted, plus you can track it on-line. 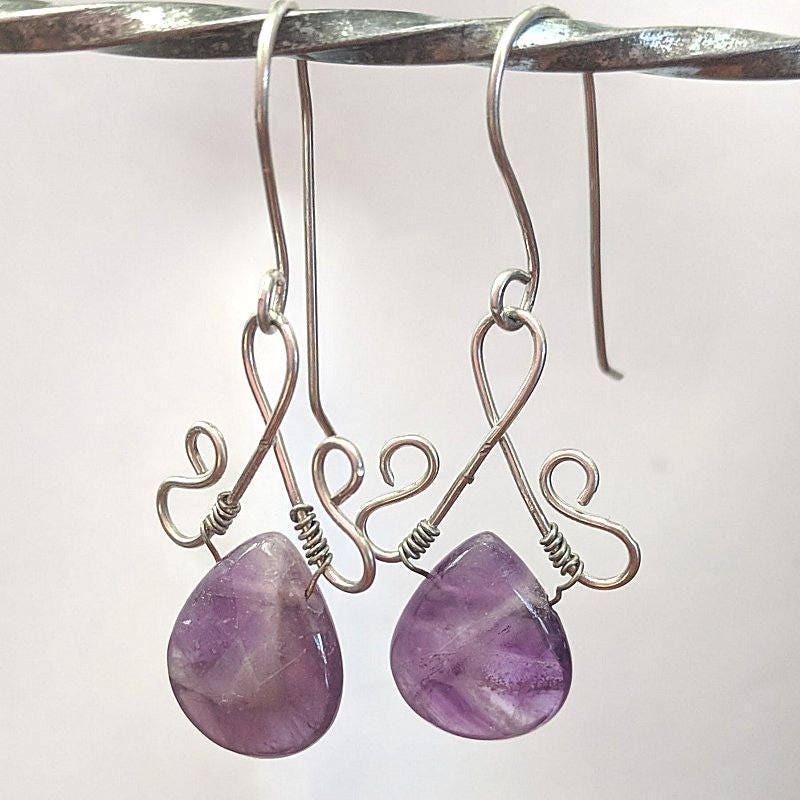 Amethyst is the birthstone for the month of February.on the Modern, Traditional, Spanish, Jewish and Ayurvedic Birthstone Charts. Also, for Pisces on the Zodiacal Birthstone Chart from February 19 - March 20. Amethyst was used as a gemstone by the ancient Egyptians and was largely employed in antiquity for intaglio engraved gems. Roman intaglio engraved gem of Caracalla in amethyst, once in the Treasury of Sainte-Chapelle. 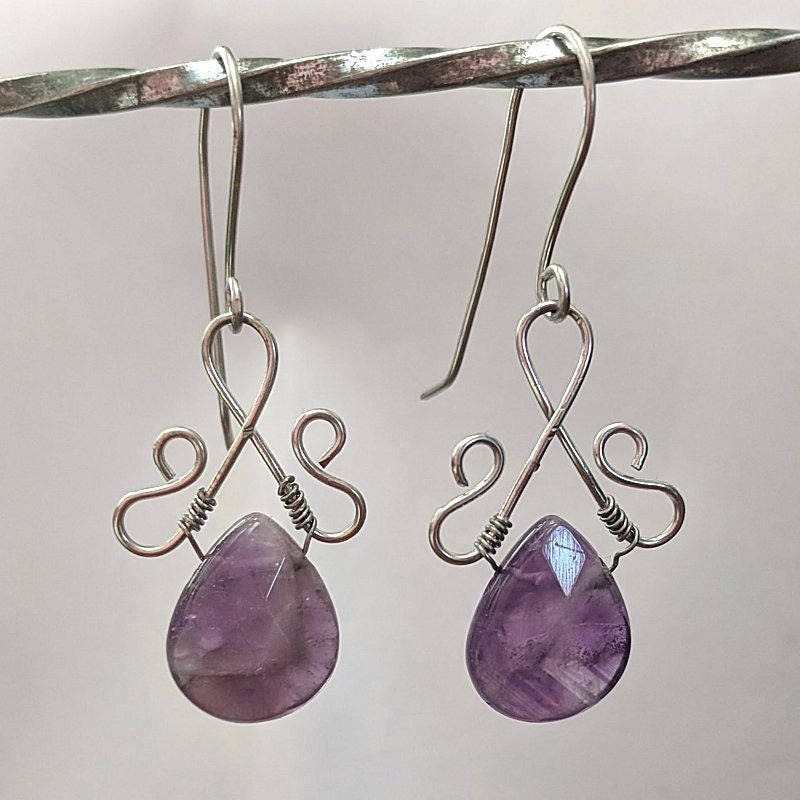 The Greeks believed amethyst gems could prevent intoxication, while medieval European soldiers wore amethyst amulets as protection in battle in the belief that amethysts heal people and keep them cool-headed. Beads of amethyst were found in Anglo-Saxon graves in England. Western Christian bishops wear an episcopal ring often set with an amethyst, an allusion to the description of the Apostles as “not drunk” at Pentecost.